This is the vine, knitted in twine, made by Jack’s grandma in double-quick time, that swings from the tree (two metres tall), made out of cardboard and wood in the hall… that holds up the coconut Jack made! Year One’s homework is to make something for the jungle display. Jack would rather play football – so he rolls some clay into a ball and says it’s a coconut. But Jack’s family don’t feel this is quite enough. So Dad makes a tree and Grandma knits a vine, Mum makes a snake and little Fred donates a stuffed parrot. Soon it’s a glorious palm tree, worthy of a place among jungle huts, anteaters and insects! 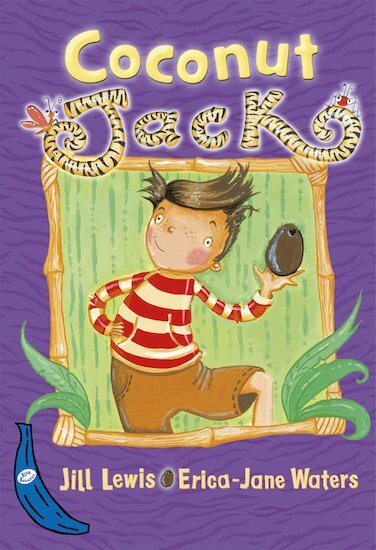 But when the family take Jack’s new coconut tree to school, disaster strikes… Told in bouncy rhyming couplets with colour artwork throughout, this comical tale is an ideal step up from picture books.